Make a clean sweep of our beautiful neighborhood by joining the Park Slope Civic Council at its annual spring beautification, recycling and clean-up event — the Spring Civic Sweep on Sunday, April 14th, 2019. We’ll serve refreshments, and we’ll provide all tools and supplies. Volunteers will leave wearing “I Made Park Slope Cleaner Today” stickers. Community Service vouchers will be available. Common Milkweed plants, a critical resource for Monarch butterfly reproduction, will be given away along with one or two other native perennials. The Lower East Side Ecology Center will collect unwanted electronics for recycling. 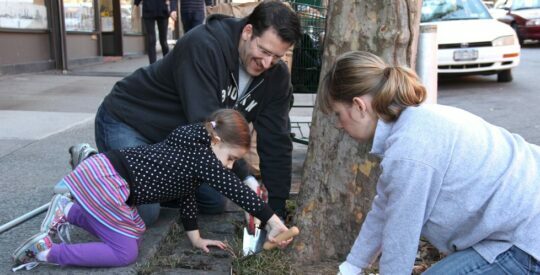 Celebrate Spring by Sweeping the Streets Clean with the Park Slope Civic Council! Many hands do some very good work!